Cocos Creator v2.0.9 support for the Baidu games platform and greatly optimizes the performance of DragonBones/Spine on small games and web platforms. WeChat mini games also brings improved resource loading performance and dynamic text refresh efficiency. At the same time, we have further improved the compatibility and stability of the engine and editor, so that everyone can get a better development experience. Good quality is inseparable from careful polishing. Thanks to the feedback from developers on the community, GitHub, Cocos corporate services and other channels. Cocos Creator officially supports releasing to Baidu games. For detailed usage, please refer to Publish to Baidu Small Game Platform. Cocos Creator v2.0.7 greatly optimized the performance of DragonBones and Spine on native platforms, with performance optimized to more than twice as fast as 1.9 and 1.10. This release, v2.0.9, for Web platforms and non-native platforms. SHARED_CACHE and PRIVATE_CACHE acceleration modes, have improved DragonBones performance by 15 times, and Spine’s performance has improved by 3 - 6 times. The score of the test is converted from the frame rate and the number of animations. The higher the value, the better the performance. The lower the score of the test, the less memory is occupied. The more animations SHARED_CACHE saves more memory. In Build panel, publishing to __Android App bundles** has been added. When checked, Android native games can be published as App Bundles. After submitting the App Bundle to Google Play, Google Play will dynamically download different versions of the APK based on the differences in the player’s phone parameters to reduce the game’s package size. When you import CCB and Cocos Studio projects repeatedly, the original folder will be overwritten and no more copies will be retained. 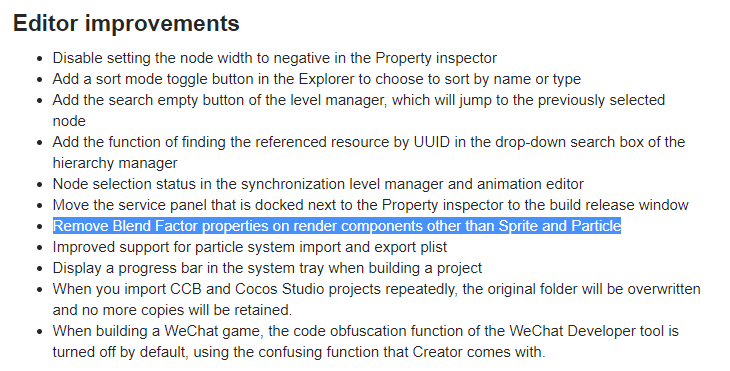 When building a WeChat game, the code obfuscation function of the WeChat Developer tool is turned off by default, using the confusing function that Creator comes with. Fixed automatic syncing of Prefab when saving scenes, in some cases, you will be prompted to save the reference. Fix DragonBones If you include a sound file, the animation will report an error. If this version frequently modifies the node’s zIndex in the code, the performance overhead may be large and we will optimize it in the next version. On the Baidu small game platform, there are still some problems for the time being, we are working with Baidu engineers to fix it. If I’m not using any 3D features, is it safe for me to “downgrade”(sidegrade?) from v2.1.0 to v2.0.9? I’m interested in the performance improvements for native 2D games and updated Spine runtime. Are the changes (performance boost) for DragonBones and Spine also possible for cpp or did the engine get no update. Good question. Let’s get an answer to this. Answer: 1. yes, you can downgrade, but backup the project first just in case anything unexpected happens. It hasn’t been updated. Let me ask the engineering team if there is a plan to include these updates in cocos2d-x. Answer: I will need to get with Minggo and ask him his plan. What is the reason of removing blending modes from other components? We were using it on the motion streak component and that worked perfectly and looked so good. How is it designed to be used now? This was under editor improvements, but seems it’s something that was taken away from it. Let me know if I’m missing something. Thanks for your help! @Ronsku Let me ask engineering for their thoughts on this. It’s true that we should keep it in MotionStreak, we have missed it. Thank you so much for the super quick response, I really appreciate it! Awesome that there is a way to go around it, I will create a custom component for it, for now.